Paul Drye’s 2015 False Steps: The Space Race as it Might Have Been delivers exactly what it promises on the cover: a grand tour of the spacecraft that failed to make it from drawing board to reality over the last seventy years. Drye limits himself to the history of crewed spacecraft; probes may offer far more bang for the buck (a factor in the failure of many of the spacecraft included in this volume), but they lack the romance of humans in space. Drye covers three broad historical periods: World War II to 1957 (the year the first artificial satellite was launched); Sputnik to the Moon (which despite the name covers a little past the end of manned missions to Earth’s Moon); and Shuttles and Space-stations (Disco Era to the present day). Each section explains what actually happened, which puts what did not happen in context. Each chapter ends with an explanation for the failure to build the various spacecraft, and speculates on what would have been necessary if the plans were to see fruition. Some ideas were clearly doomed; others, not so much. Some designs were more speculative than others—it is not being unkind to call the Sun Gun a fantasy even by Nazi standards—but others were more fruitful; the VKA-23’s intellectual lineage survived until 2009. That would have taken 84 successful missions … but perhaps Steele missed that detail. Some of these were more pre-doomed than others. Others were quite plausible but unlucky. Some were simply bad ideas, like the manned Venus mission using repurposed Apollo gear to lob a crew past Venus to perform work that science robots could do more cheaply. They would have been just in time, as it turned out, to experience a large Coronal Mass Ejection up close and personal. For the most part, Drye leaves any discussion of nuclear rockets to other authors. The main exception is his take on the nuclear powered shuttle, a bold proposal that inspires me to once again say “I can see no way in which this could go horribly wrong.” But at least it was an American idea and not a Soviet notion…. Reading about the problems the Soviets experienced with bitter internecine rivalries made me realize that the US was denied some entertaining drama when Eisenhower decided on a civilian space program. I would like to read alternate histories set in a world where the real space race is between the US Army, Navy, and Air force. Again, some of these ideas were more pre-doomed than others, thanks to such issues as politics, economics, and the fact that they were bloody stupid ideas. “The solution without a problem” also appears. Some, however, may reappear in the future with proper funding and a role to fill. There is also a chapter on the Chief Designers, the dreamers whose visions shaped crewed spacecraft in the 20 th and early 21st centuries. A text like this inspires dreams of “what if,” which in turn can become “if only,” and then full scale Dolchstoßlegende filled with ranting about (now) long dead senators from Wisconsin , welfare as the killer of the flying car, and complaints about how “the first Mariners and Veneras ruined things for us.” I am happy to say that Drye avoids this pitfall; I would like to think that being Canadian and thus exposed from an early age to Avro-Arrow-related bitterness immunized him. Stupid Diefenbaker . This is not a long book but it is fairly dense and educational. Many of the unsuccessful proposals were new to me. Drye’s style is straightforward but not dry; he even finds room for low-key sarcasm about some of the less plausible ideas. 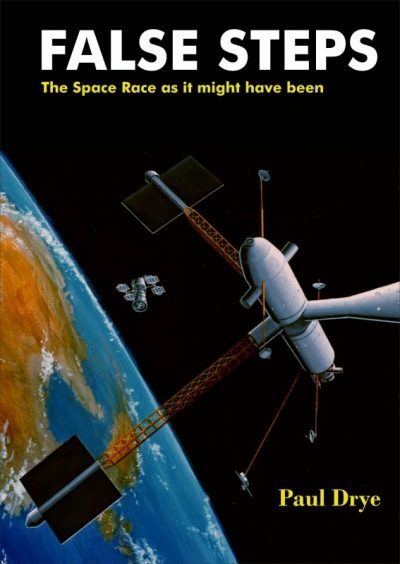 False Steps: The Space Race as it Might Have Been is available from Smashwords.